Are you a Mac user then this time Apple has brought an eye-pleasing feature for your Mac. We are talking about the Mac dynamic wallpaper clubbed with shuffling, lightening, resolution effects and in a wide range. What is Mac Dynamic Wallpaper? Mac Dynamic wallpapers are not like the regular or custom wallpaper that we use on a regular basis. It is a new feature for Mac users, where the wallpapers will change the lighting and brightness with regard to the time. For instance, if it is bright daylight then the dynamic wallpapers will be with sky and sun and visa-a-versa for the night and afternoon sessions. How to set Dynamic wallpaper feature in Mac? First go to Desktop and Screen saver, then click on Desktop and Pictures. Click on the wallpaper that you want and then select Dynamic and save. You can try the same steps for the custom wallpapers as well. 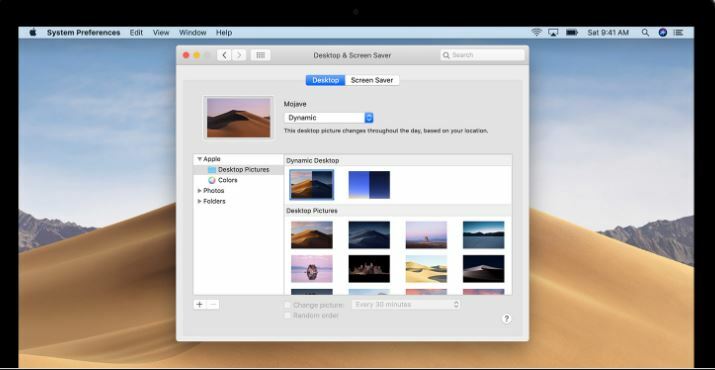 Choose between Solar Gradients and Mojave as per your likings. Note – Dynamic wallpapers will work with the location of the respective place. Thus, you need to keep your location enabled all the time. How to get Mac dynamic wallpaper? Here we will tell you easy ways to get these dynamic wallpapers for your Mac. Online – There are a number of websites available using which you can enjoy the wallpapers for your Mac anytime. Here you will get a number of options to choose from based as per your requisites. On your own – Yes, you can now make your boring wallpaper into a dynamic one with the help of the effects and features available in Mac itself. Some of the features are glass droplets, blur, distortion, colors and so on. Thus, you can play with the wallpaper and create a masterpiece. The new feature of Dynamic wallpapers launched by Apple is really cool. It is free to use and the effects are just impeccable. Hopefully, Apple will come up with more lists of such wallpapers in the forthcoming days as well.